Since 1969, locally-owned Fraser Valley Refrigeration Ltd. has grown to become one British Columbia's largest privately-owned and operated, refrigeration and air conditioning companies. 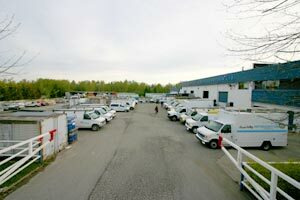 We offer you professional and reliable service from our 20,000 sq ft headquarters conveniently located in Aldergrove, BC. Refrigeration - Industrial and Commercial (ammonia and non-CFC). HVAC - Heating, Ventilation & Air Conditioning. Electrical - To complement and service the above, plus computerized control systems. We serve over 5,000 clients, mainly in the lower mainland, representing nearly every type of application, from large process cooling plants of 1,000 HP, through smaller highly specialized systems, to very small units such as bar coolers. We have over 80 fully-trained, professional employees. A list of current staff is available on request. All have trade qualification and licensing. We pride ourselves in our attention to excellent customer service and our staff's commitment to doing the job right the first time. We also guarantee our workmanship. We stay attuned to the evolution of products, and recommend regular upgrading to keep up with the rapid advances being made in the electronics and heat transfer fields, energy efficiency and environmentally-friendly improvements. We know the latest technology in our industry and pass our knowledge on to you. Fraser Valley Refrigeration provides 24 hour service, second to none, and our large parts inventory usually allows the job to be completed, even at those inconvenient times breakdowns always seem to occur. Each of our 60 service vehicles is well stocked with necessary parts and tools to ensure expedited service and solve your problems quickly. Serving: British Columbia including Vancouver, the Lower Mainland & Vancouver Island.